Writing, Surviving & Thriving: Support My Friend! I've shared with you all that I'm a church girl. I started going to church in the womb. 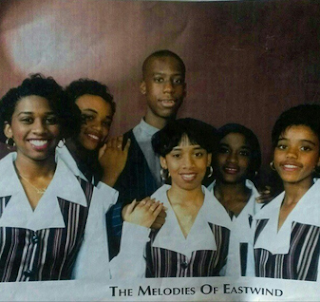 Growing up, I sang in the church choir and even participated in a singing group. If this pic doesn't scream 90's, I don't know what does. Yes to those flying saucer hair cuts! Well, if you look closely, you just might recognize the guy in the picture. That's Robert Glasper, jazz pianist extraordinaire, who also happened to be our church piano player back in the day. He's like family. So humble. So funny! He's not just brilliant; he's a great person. Do your ears a favor, and pick up his music if you don't have it. "Of Dreams To Come: Robert Glasper" - Indiegogo Campaign from Of Dreams To Come on Vimeo. Until next time . . . go over to Kickstarter and donate!